Hundreds of people in London and Berlin have commemorated the International Quds Day, marching in support of the oppressed people of Palestine and against the decades-long occupation of the Palestinian territories by the Israeli regime. Demonstrators in London convened in front of the Royal Embassy of Saudi Arabia on Sunday, shouting “Death to Israel” and other slogans against the occupying regime in Tel Aviv, while expressing solidarity with Palestinians. 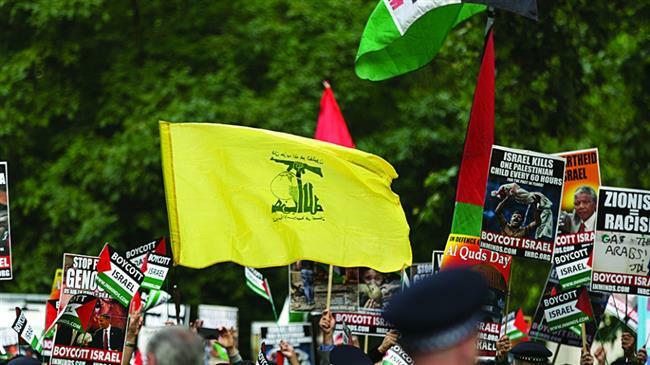 During the rally, which began at 3 p.m. local time, protesters also carried a number of flags of the Lebanese resistance movement Hezbollah, which has been a significant aid to the Lebanese army defending the Middle Eastern country against Israeli aggression. The London rally also came a day after a similar demonstration was held under scorching heat in the German capital of Berlin, where some 1,600 people gathered to voice solidarity with Palestinians and their strong dissent against the Israeli regime. The demonstration was staged in the western part of Berlin under heavy restrictions imposed by the police. Protesters were carrying Palestinian and Lebanese flags during the rally. They shouted “Zionists are the perpetrators” and “Zionists anywhere, you will lose everywhere.” They also called for a boycott of Israeli products. The full text can be found on PressTV published on 10 June 2018. Islamophobia Awards 2018: VOTE NOW!